On Thursday, at about hole eight, it dawned on Connor Belcastro that he’d done it again. As he had in three of four Junior Amateur matches earlier in the week, he’d dug himself a hole from which he’d have to climb free. 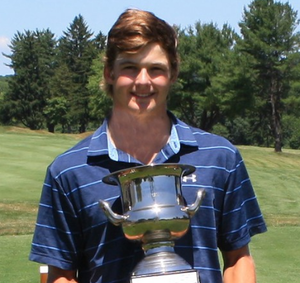 Down two holes after the opening nine, Belcastro won four straight to win the 77th Connecticut Junior Amateur Championship at Watertown Golf Club. Winning the 10th and 11th with pars, he birdied the 12th and pared to 13th, allowing and him to overtake 15-year-old Matt Doyle, whose steady hand on the greens had begun to waver. When Belcastro won the 15th with a par as Doyle lipped out a tying putt, Belcastro was dormie three. Doyle, who the day before had defeated highly-respected Justin Mathew, one of only two Connecticut juniors to qualify for next week’s U.S. Junior Amateur at Baltusrol Golf Club, was not able to his approaches as close as he had earlier in the week, and three-putts from the fringe of both 10 and 11 set off the backslide. “It’s tough when you’re leaving yourself 50- and 60-footers,” he said. “And today, off the tee, I was leaving myself in places where it was was difficult to get the ball close. My distance control was not quite there.” When he did put an approach close, as he did on the par-5 seventh, he converted. But so did Belcastro. On the pivotal short-4 12th, both hit shots fairly close—Doyle neatly from the right rough—but Belcastro made the birdie from 15 feet and Doyle was unable to convert it from a couple feet further. It was at 13 that things might have gone very differently if not for a moment of sportsmanship on Doyle’s part. Belcastro had moved his marker for Doyle, and was about putt without replacing it when Doyle reminded him to put it back. Had he not, and had Belcastro putted from the incorrect position, he would have forfeited the hole and the match would have been even. For Belcastro, it had been a week of curious challenges that began with a very tough draw. To reach the final, the Brunswick rising senior had to meet and defeat two of his friends and school teammates: Matt Camel and Thomas VanBelle, Camel arguably the hottest junior in the country last week. The week before he had won the AJGA Otter Creek Junior Championship in tournament in Columbus, Ind., by 10 shots, matching an AJGA 54-scoring record of 19 under par and, incredibly, making holes-in-one in two consecutive rounds. Camel, a favorite at Watertown, had eliminated another favorite, CIAC Open Champion Chris Fosdick, in 19 holes. In the semis, Belcastro had to come from behind to defeat Darien’s 16-year-old star Alexander Gu, two up. It was 15 minutes before the Gu match, warming up, that Belcastro discovered a crack in the face if his Callaway Rogue driver. Watertown Head Professional Ian Marshall, himself a former Junior Amateur Champion, replaced the head with a newer Rogue model and, with “four or five holes” of adjustment, the very adaptable Belcastro was comfortable again. Meaning that he was hitting his drives about 300 yards. Connor’s name now goes on a trophy that henceforth will be known as the Bill Salvatore Trophy, after Watertown star Salvatore, who won the Junior Amateur three consecutive times from 1956 through 1958, the only player in Connecticut history to win it thrice. Salvatore, 77, was on hand to acknowledge the naming by CSGA Executive Director Mike Moraghan. “I am try humbled by this honor,” said Salvatore.